Wish to improve your performance and spice up your love life? Let's find out why Pilates should be essential in your work-out routine for a delightful love-making session! 1) SO WHAT IS PILATES? Despite the reputation that Pilates has of being a woman’s workout, the exercise was actually invented by a man named Joseph H. Pilates, and was intended as an alternative workout for both men and women. It's no harder for women (no heavy weights involved), as it is going to be any easier for men - making it the perfect couple workout. Pilates is founded on healthy movement principles, and with benefits that include core strengthening, injury prevention, flexibility and increased endurance for male or female, it would be unwise to exclude yourself from trying this powerful alternative fitness program. The secret to a stronger and more lifted derrière lies in working the main extensor muscle of the hip, the gluteus maximus. The good news is, strengthening your glutes is part and parcel of every Pilates class. Alternatively, if you’re not, in fact, all about that bass, pretty much all of Pilates is centred on strengthening the core, especially the transverse abdominals. It will pave your path to those killer abs you’ve been working on. 3) LOVE GENTLY OR PASSIONATELY WITH PILATES "CONTROLOGY"
With benefits such as an increase in flexibility and maximising your mind-body connection, it’s no surprise that picking up this daytime exercise can improve your nighttime activities. Pilates works on strengthening the core, including the pelvic floor, which means that men & women who practice the exercise tend to have better control and muscle sensation of their body - thus, assuring both a transformational experience in the bedroom. A key element to Pilates is muscle control. Control is the focus rather than speed. It’s not how fast you do or the number of reps that produces results, it’s technique. Pilates gives you steady strength and stamina during sexual activity allowing for a longer, more intimate experience. Sticking to the same old exercises all the time may cause your body to adapt to the activity and inhibit progress. Some muscles, namely those that dominate your usual exercises, grow to be stronger than others, and a large portion of Pilates is developing those often-neglected muscle groups. Pilates involves consciously moving in certain ways to train parts of your muscles that aren’t typically used while doing other types of workout, enabling you to be in the best shape possible. 5) LOVE IN THE MAKING! 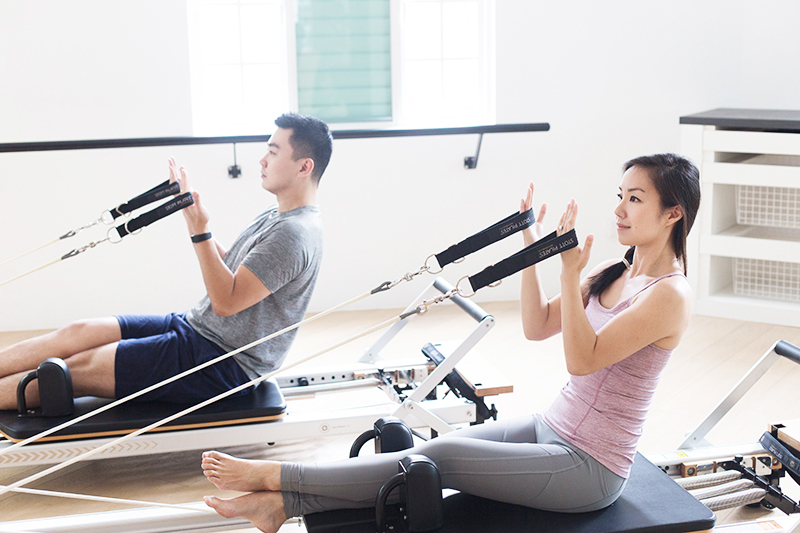 In Pilates, you get to use your own body as well as different machines like a reformer or tower for resistance. Because sexual activity often requires you to use and support your own body weight, your strong Pilates body will not become easily fatigued. Furthermore, due to the focus on breathing in Pilates, mindfulness is often practiced. In order to work your body correctly, safely, and efficiently, you must concentrate throughout the exercises. Pilates trains your body and mind to be totally present. This will carry into the bedroom, allowing you to be fully present with your partner for a more intimate and delightful love-making. As Joseph Pilates himself has said, “In 10 sessions, you will feel the difference, in 20, you will see the difference, and in 30, you’ll have a whole new body”. Give you and your partner a chance to be enchanted! What are you waiting for?